As a serious cook, a social kitchen was an afterthought, not initially a necessity. This past July, after visiting House Beautiful’s Kitchen of the Year, designed by Mick DeGiulio, I realized what was missing in mine: a place for Mr. AM or a visitor to sit down, hang out and socialize. In other words, a social kitchen. Many people have seating “bars” in kitchens but I find stools so uncomfortable I’d honestly rather stand. As empty nesters, we don’t need a kitchen table. And, unless I’m standing at the sink looking out the window, there’s a doorway in every direction because my kitchen functions like the hub of a five-spoke wheel: it opens into our spacious sun room/dining room that was added to the back of the house, the TV room, the back hallway, my office (formerly the dining room) and the foyer. There isn’t a single unbroken wall. We have major flow – oh yeah. 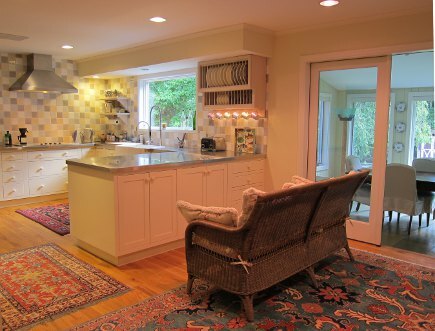 In his book “Kitchen Centric,” Mick talks about why he added a pair of chairs and love seat after his kids left home. I was reading in preparation for what would become our video interview, not for ideas to change my own house. When we did our renovation nine years ago this was a second home. I took a practical approach and set up a kitchen for one cook – me. My priority was the functionality, storage and appliances – not furniture or accessories. 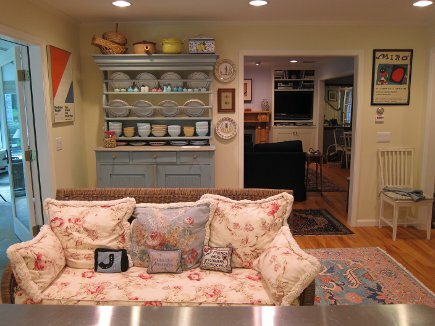 One downside of our layout is the 10-by-10 foot area between the peninsula and my blue Swedish hutch defined by one of our rugs. Peninsula drawers and cabinets and the ones on the hutch open into that space. Plus, it’s a high traffic passageway and standing room when friends come over. Early one morning in August, I was walking around the sun room in my robe, enjoying the view and a cup of coffee when my eye fixed on a 5-foot long wicker loveseat which had originally been in the sun room, then moved to my office, then back to a spot where it really didn’t fit very well. Hiking up my robe, I walked it up one step into the kitchen and pulled it over to face the peninsula. It was an odd place for a sofa, I knew. No designer would plan to place a sofa on the service side of a peninsula. 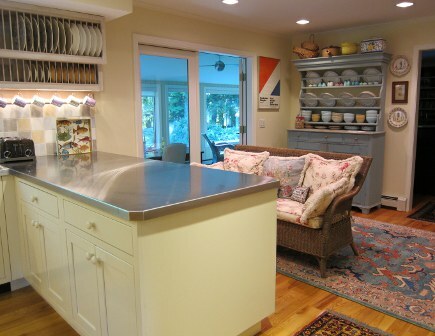 But I decided to leave it for a while — it filled a need in the kitchen and freed up space elsewhere. Also, it was quirky, a quality I admire. Later that morning, Mr. AM came downstairs. I handed him his tea and when he headed right for the sofa to drink it, I knew I’d made the right decision. When friends come over now, that sofa is where they sit. 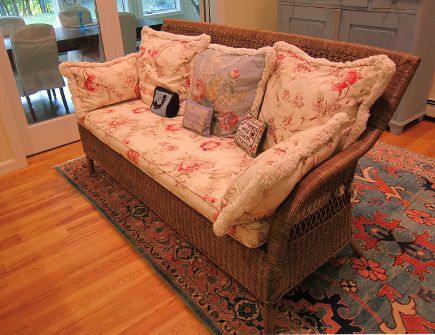 Since the seat cushion is rather flat, a plate of snacks, a stack of magazines, or a tray can be put down nearby. There’s no room for a side table and, besides, the sofa has arms. I can spread out my recipes there and prop up the iPad. My kitchen concept was updated from the 20th century to the 21st without buying anything new. Nothing I’ve done seems smarter than my social kitchen and the welcome it suggests has never been warmer. How creative! 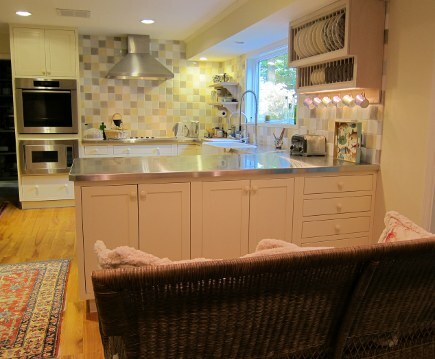 Your kitchen is beautiful and you have created a perfect place to cozy up with the cook! Wow wow wow wow wow. Wowee! Love it! Really love it! Oh, in case you couldn’t tell, I’m really into this fab update on your already fabulous kitchen! Saw your article on Atticmag re: your sort-of “in” the kitchen sofa—and that’s sort of what we have/did when we flip-flopped our LR and DR, and put a sofa (sectional) in what had originally been the DR. Granted, our sectional is against a wall (rather than free-floating like yours), and the space it is in, is technically an actual room, but the function for us, is the same. It’s a place for people to sit while last minute dinner prep is going on, be close to the cook (that would be me! ), for people to be in the kitchen, without being IN the kitchen. (LOL) Nobody ever goes to sit in a separate LR during gatherings, so I think your and my set-up is the perfect solution, and the best of all worlds. Such kind words MV, thank you. Now I need to get you up here to actually sit on that sofa with a drink! catmom, you and i share a love of informality in addition to modern style. i do actually have a “living room” but it’s small and not separate since everything is so open. We do sit in there with friends but I need a pair of chairs, not the single one I have to complete it. One of my next tasks. LOL.